When children draw a tongue - either as part of a smiling face or in the mouth of a dog - they usually color it pink. In reality, though, this isn't always the case. Most patients think the strangest part of an acupuncture treatment is when they're asked to stick out their tongue so that the acupuncturist can analyze it. What exactly does the tongue tell us? 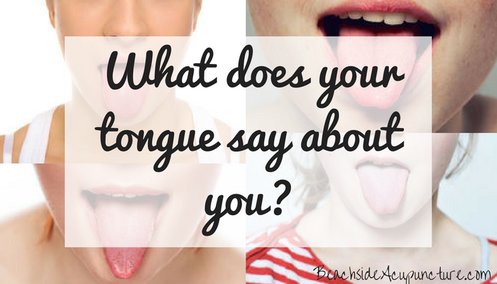 Some - more likely very few - of you may have noticed changes in your tongue before. For instance, you may have seen its coating getting thicker as you caught a cold or the tongue body becoming redder as you developed a fever. The tongue reflects how a person's body is balanced, generally in a more long-term way than pulse diagnosis. Tongue diagnosis is involved, but below you'll find a short(ish) list of what an acupuncturist is observing. Some of this can be affected by what a person did that day. With this in mind, it's best not to eat or drink anything that may stain your tongue before your treatment. (Coffee and colored candies are the usual culprits here.) Also, we've had patients tell us they scraped their tongues so that it would look better for us. Don't do this! Although it's a nice gesture, "cleaning" your tongue will skew our interpretation of what's going on in your body. You may be wondering why acupuncturists need to ask you questions if the tongue already says so much about you. 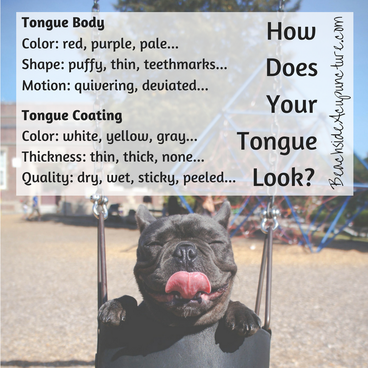 While it's true that a diagnosis can be made just by looking at the tongue, most practitioners use tongue observation as a way to confirm what they already diagnosed based on your answers to their questions. Also, two people may have similar tongues but different symptoms, so using both methods give the acupuncturist more insight into what is going on with each individual.